1/07/15 – In a historic visit by Chinese Premier Li Keqiang to the OECD in Paris, the People’s Republic of China today decided to enhance longstanding collaboration with the OECD and to join the OECD Development Centre. The visit, the first to the OECD by a Chinese State Leader, coincides with the 20th Anniversary of OECD/China relations as well as with China’s upcoming G20 Presidency in 2016. In the presence of Premier Li, Chinese Minister of Commerce Gao Hucheng, who is in charge of coordinating the Chinese government’s collaboration with the OECD, and Secretary-General Gurría signed a Medium-Term Vision Statement and a joint Programme of Work for 2015-2016. These documents state the importance of the OECD-China partnership to help address evolving challenges in the years ahead. The Programme of Work foresees that China and the OECD will strengthen cooperation in 20 policy areas, ranging from macroeconomic management and structural reform to regulatory and public governance to green growth. It will also support China’s efforts to further open up its economy. As a crucial pillar of this cooperation, the OECD will offer its evidence-based expertise, its working methods as well as its global governance know-how to support China ahead of and during its 2016 G20 Presidency, in particular in the quest for new sources of growth for a more open and more inclusive world economy. 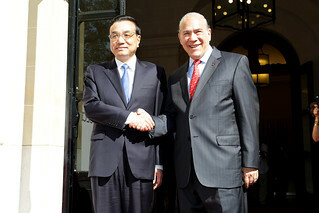 1 July 2015 - Official Visit of Li Keqiang, Premier of the People's Republic of China to the OECD. The cooperation in this field will continue to be underpinned by the OECD China Skills Development Programme developed by China’s and OECD’s G20 Sherpa on which the Chinese Minister of Foreign Affairs Wang Yi and OECD Secretary-General Gurria signed a Memorandum of Agreement. As part of the official visit, China also took the important step of accepting the invitation to join the OECD Development Centre in an agreement signed by the President of China’s Development Research Centre of the State Council, Li Wei. This accession brings the Centre’s membership to 49, including 22 non-OECD members, such as Argentina, Brazil, India, Indonesia and South Africa. The OECD Development Centre is a platform to bring together countries at different levels of development to discuss policies that stimulate growth and improve living conditions. Premier Li delivered a keynote address in the context of the OECD Leaders Programme. The Premier was accompanied by ministers and high- ranking officials of the Chinese government. China, as a Key Partner of the OECD - along with India, Indonesia, Brazil and South Africa - is invited to participate in the work of the Organisation, with a view to possible membership. As the OECD works to build a stronger, cleaner and fairer world economy, it makes an important contribution to the socio-economic progress and the reform processes of countries at different stages of development. For more information on the visit of Premier Li to the OECD, contact the OECD Media Office at +33 1 45 24 97 00. For information on China’s relationship with the OECD, contact Vanessa Vallée at +33 6 28 56 06 10. For information on the OECD Development Centre, contact Bochra Kriout at +33 626 74 04 03.